During National Small Business Week, I wanted to take the time to introduce Chuck Belden. He’s a former college athlete in lacrosse and has been involved in sports his whole life. Though he has a degree in exercise science, after he left college and stopped working out, he became a real estate agent and eventually gained 50 pounds. On the advice of his wife Brook, a personal trainer and psychotherapist, he tried the Herbalife Nutrition products she loved and began incorporating exercise into his life again. What do you enjoy about owning a business? I love being in control of my future and that I can dictate my day-to-day work life. I’m married with two small kids, and can bring my kids to work whenever I need to. I love the ability to create a legacy, something that lasts. I want to build something other people care about, that becomes a part of their life. 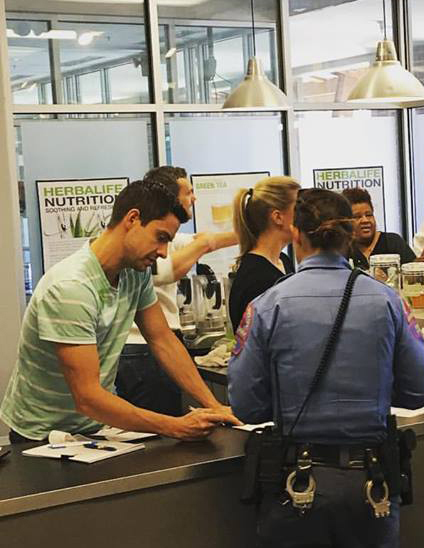 Herbalife Nutrition independent distributor Chuck serves the morning rush at his nutrition club, Nourish, in Raleigh, N.C.
What is the biggest challenge of being a business owner? What advice would you give to others who want to start a business? It doesn’t really matter what business you’re in, but if you can find a way to serve the most people, you’ll be successful. My advice is to not chase the dollar but to chase what makes you feel excited and passionate. Serving people and making a positive impact is important to me. You need enough passion to work through the tough times. My answer isn’t about research. It’s not about having the right investment or finances. Find what lights you on fire and then you’ll figure it out as you go along. What motivates members to visit your club? What keeps them coming back? Our club is called Nourish, and our mission is to strengthen, build up, and promote not just the individuals we serve, but also our community. My experience in opening bars taught me how to create a positive environment. I use the same idea at Nourish. In our club, I’m the guy that’s getting everybody together. What that does is it gets people tied to more things than just shakes, tea and aloe. People fall in love with those things, but I think they really fall in love with the community. They get to know each other. They get to know us. We want every single person who comes in to our club to leave feeling better than when they got there. Sometimes they feel better from the nutrition. Sometimes it’s because they got to smile. Sometimes it’s because they got to hear a really fun song. Our goal is for however long we have you in front of us, we are going to try and impact your day in a positive way. It sounds like you have a daily plan, as well as a long-term strategy—is that correct? I have a pretty broad vision when it to comes what we can do with this business. Details are a challenge for me (luckily, my wife is very detail-oriented). I want to really make a difference with my Nutrition Clubs. I want to offer Herbalife Nutrition to communities as an alternative to fast food. We have about 10 coaches working part-time out of Nourish. I do a lot of business-to-business meetings. I like to walk into companies and offices and introduce myself as a local business owner, offer an opportunity to come in and bring them a free sample and talk to them about health and nutrition. They always come over to the club at some point. I really like going out and meeting new people, and talking to them every single day and growing our business that way. Lauren brings other great qualities to the table. She has management experience, but when it comes to personality, she is the energy, she is the party, and she is the laugh. Everything is no problem. She is excited all the time. People are drawn to that. Were there ever uncertain times? At times I did get a little fearful and wondered if I made the right decision, but what I’ve learned is to try and get those thoughts out of my head as quickly as possible and focus on the joys and benefits of having my own business. I look at my “reason why”—my family—every day. Being business partners with my wife and Lauren has really given us a huge advantage. We can share responsibility. We both have the same vision. We are in this for life. We love it. This is our entire future. We believe in the company. We believe in the products. We love our nutrition club. Anything we can do to give back, we are more than willing to do so.